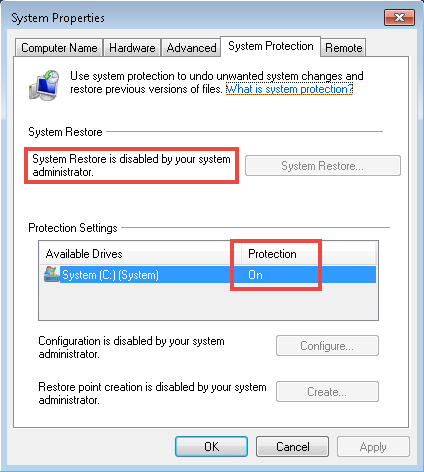 System Restore is an important Windows option that often allows the computer to return to a working state after failure. 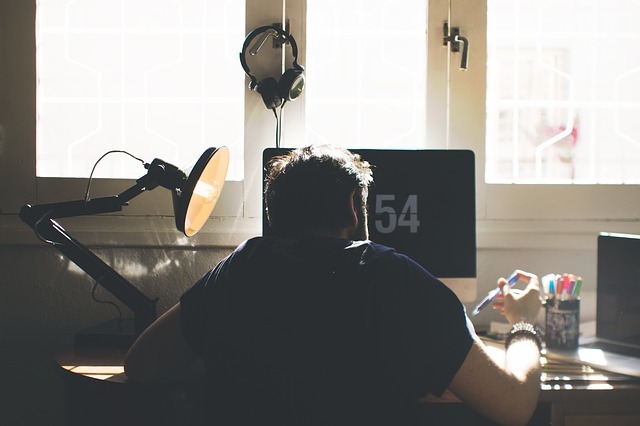 You need to get busy with enabling the system recovery function and creating backup points before any problems with the operating system will appear. However, in some cases, you may encounter the error “System restore is disabled by your system administrator”, which occurs even from the computer’s administrator profile. In this article we are going to tell you how to cope with this problem in various versions of Windows. Allowing various applications to make changes to the system, many users often do not even think that this kind of actions may cause all sorts of problems. Most often, it is because of issuing permissions for various third-party programs to make changes to the system, the error in question arises so often. 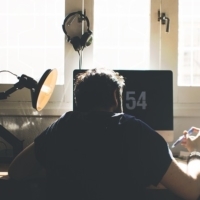 At the same time, applications that disable system recovery are not always viral. Often these are programs that promise to optimize the system automatically. For example, the SSD Mini Tweaker application. The main task of this app is to optimize Windows performance on a solid-state drive, and it may make changes that disable the system recovery function. Another reason for the “Restore system disabled by your system administrator” error to appear is the activity of various viruses on your computer. That is why we recommend that you check your PC with antivirus program after performing the steps described below to resume the system recovery function. There are two options for solving the problem in question. 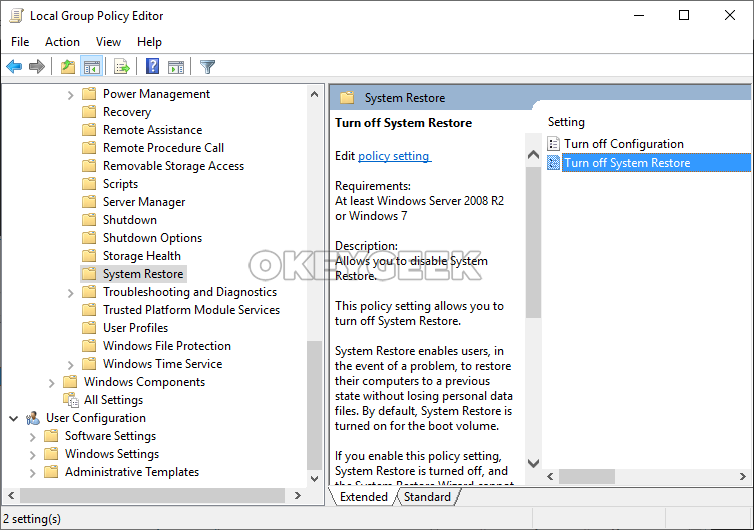 The method of restoring a function through the Registry Editor is suitable for any Windows version, while the error correction option through the Local Group Policy Editor is designed exclusively for “Professional”, “Maximum”, and “Corporate” Windows editions. Let’s see how you can correct the error in both ways. 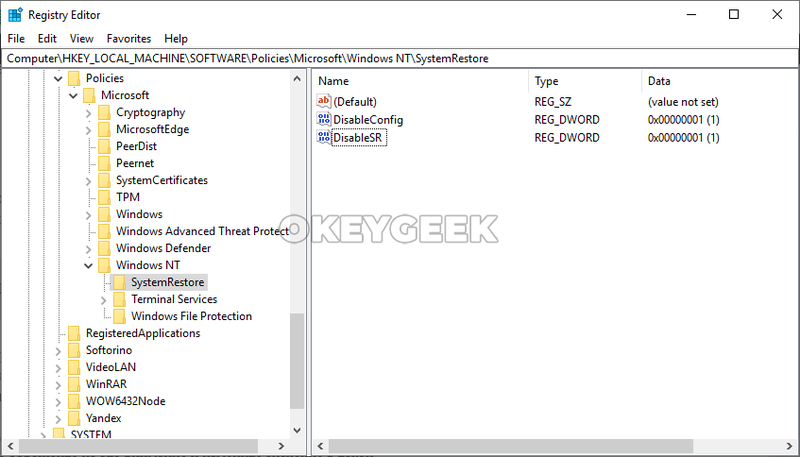 Once you find yourself in the SystemRestore folder, you are going to need to change the DisableConfig and DisableSR parameters. If there is the “System restore is disabled by your system administrator” error, these parameters will be set to “1”. In order for the recovery function to work again in normal mode, you need to set the parameter to “0”. Expand the properties of the parameter by double-clicking on it and change the value. Note that in a number of operating system versions one of the required parameters may be missing, do not pay attention to this and change the value in this situation only for the available parameter. You can also correct the problem if you simply delete the entire SystemRestore folder in the registry or perform a Registry repair. 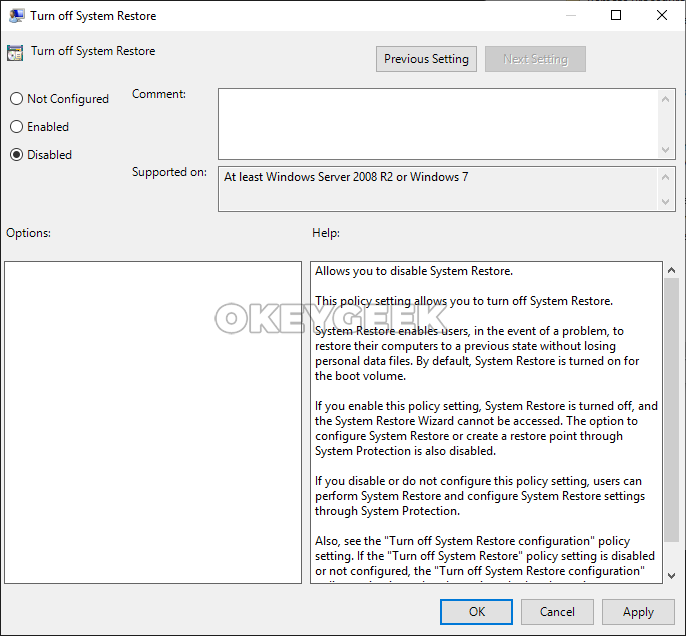 In the “System Restore” folder, two states will be available – “Turn off Configuration” and “Turn off System Restore.” It is necessary to double-click on each of them and set their values to “Disabled”. After performing any of the above methods, you will need to restart your computer. And then the “System restore is disabled by your system administrator” error should be corrected unless another application will make a change immediately after booting Windows. In such a situation, it will be necessary to detect this program and delete it, in the same time it is important to remember that such a problem may come from a virus.